Dyson vacuum cleaners are known for their innovative technology, user-friendliness, and funky colourful designs – and the Dyson V6 Animal is no exception. A fresh addition to the brand’s line up of lightweight hoovers, it offers powerful cordless cleaning and a couple of handy tools to take the faff out of the job. Housed within its shiny purple and gunmetal shell, the V6 Animal’s technology packs quite the punch. It features a digitally controlled motor that spins up to 110,000 times per minute, making it comparable with many of today’s corded vacuum cleaners. In addition to that it features 15 cyclones, which work in tandem to boost its overall airflow and capture even the finest dust. And if that wasn’t enough, there’s also a max power mode to unleash extra oomph on those tough-to-clean areas. It’s not just the vacuum cleaner itself that has brawn – its motorised cleaner head does, too. The innovative attachment features hardy stiff nylon bristles and carbon fibre filaments, allowing it to tackle carpets and wooden floors effectively. With cordless hoovers you expect some degree of versatility and convenience – that’s the point of them, after all. The V6 Animal takes things a few steps further however, and makes cleaning floors, ceilings, nooks, and crannies an easy, seamless experience. For quick spruce-ups or car cleaning, it can quickly be transformed into a handheld device, whilst a grip-focused centre of gravity makes getting at high up cobwebs a breeze. For pet owners, Fido’s fur is no longer an issue – thanks to a mini-motorised attachment that makes light work of pet hair and ground-in grubbiness. When it comes to emptying the Dyson V6 Animal, it couldn’t be easier – you hold it over a bin and push the release button. When the job’s done you simply return it to the handy docking station, where you can store additional attachments, and keep it on charge for its next use. Cord-free vacuum cleaners are a pretty big deal nowadays, and provide the perfect solution for flats, small houses, or quick touch-ups in larger abodes. The benefits of not having a cord are pretty obvious: no getting tangled, no tripping, and no running out of cable length whilst you’re cleaning the stairs. 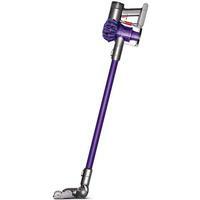 Charged via its wall-mountable docking station, the Dyson V6 Animal offers 20 solid minutes of powerful, non-dwindling, suction, giving you plenty of time to do your thing. Its run-time enhancing trigger also ensures battery power is used efficiently, so you’re not wasting any between tasks. Why you should buy it: Especially good for smaller houses and flats, this is one of the best cordless vacuums around. It’s hugely versatile, performs brilliantly and looks great. More expensive than some, but well worth the price.